Acclaimed anti-violence educator Jackson Katz argues that the epidemic of male violence that plagues American society needs to be understood and addressed as part of a much larger cultural crisis in masculinity. Whether he's looking at bullying and school shootings or gay bashing, sexual assault, and violence against women, Katz makes a powerful case that male violence, misogyny, and homophobia are inextricably linked to how we define manhood as a culture. The film gives special attention to how American media have glamorized increasingly regressive and violence masculine ideals in the face of mounting social and economic threats to traditional white male heterosexual authority. Katz's innovative cultural approach to gender violence prevention has been adopted by the NFL, the NCAA, and the U.S. Marine Corps. Jackson Katz is one of America's leading anti-sexist male activists. An educator, author and filmmaker, he is internationally recognized for his groundbreaking work in gender violence prevention education with men and boys. He has lectured on hundreds of college and high school campuses and has conducted hundreds of professional trainings, seminars & workshops. He is the co-founder of the Mentors In Violence Prevention (MVP) program, the leading gender violence prevention initiative in professional and college athletics. Visit Jackson Katz's site at www.jacksonkatz.com. Jackson Katz is available for speaking engagements at colleges by contacting Kevin MacRae at Jackson Katz. "Illustrated with movie clips and quotes from popular slasher films to inane Howard Stern comments, Tough Guise offers strong statistical and analytical evidence regarding the very real crisis arising from the widespread depiction of inaccurate and unhealthy stereotypes of male masculinity. Highly recommended." "Violence Prevention begins with a fearless look at the cultural factors that encourage violence, especially school violence. Tough Guise needs to be watched by every high school and middle school student in America." "One of those rare films that viewers will keep with them long after they leave the classroom." "In my violence prevention work, I routinely turn to MEF as a source for powerful educational and inspirational tools to challenge my audiences' understanding of sexism and its harmful effects on our social structures with a meaningful gender analysis of traditional and/or violent masculinity and the power structures that benefit from it and the concomitant negative impacts on women, children and men in Western socio-economic systems. I used portions of Tough Guise in a workplace violence prevention training that was an incredibly powerful tool to initiate significant, meaningful and critical debate and dialogue on these issues." "An excellent resource and a must-have video for all school and universities." "In this video laced with images from a range of media, Jackson Katz presents the well-supported argument that popular culture promotes an image of masculinity as ruggedly individualistic and violent, with harmful effects for both women and men. Katz reviews examples of negative portrayals of men and discusses such topics as the school shootings in Littleton, Colorado, and Jonesboro, Arkansas. However, a particular asset of this video is that it also offers alternative, more healthful images of masculinity from such movies as Good Will Hunting and Boyz 'N the Hood." 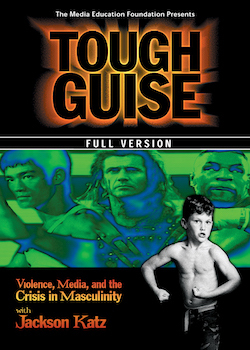 "Tough Guise critically explores more contemporary media representations of masculinity, including altnernative images of men that counter sexist stereotypes."